MSRB EMMA is the authoritative source of official statements and official filings of material events abouteach municipal bond. However, like buying stocks based only on annual and quarterly reports, investors only see a small part of the picture from official filings. Changes that impact a stock price or bond risk happen all the time. Rule G-47 requires the disclosure of material information a reasonable investor should know. Using Bitvore along with EMMA adds two important pieces for your process to support MSRB Rule G-47 disclosure compliance. First, Bitvore fills in the gap in time between filing the official statements and the myriad of daily material changes that impact the ability of a bond to generate its promised returns. Filling this time gap puts the "continuous" in "continuous disclosure". Second, the MSRB requires a specific and very limited set of material events to be filed in EMMA. Bitvore expands the breadth of relevant information dramatically. Bitvore for Munis looks at 308 material situations that impact the means of repayment and covenants for revenue and general obligation bonds. In equities, slow sales, lawsuits, and changes in executive leadership, are a few material changes that can quickly move a stock price. Municipal bonds are behaving more like stocks all the time. The material changes that happen to a bond with little warning are numerous. For example, a large change in the tax rates or base, the loss of a revenue stream or declining use of a facility, a declaration of a fiscal emergency or a school district decision about looming pensions are a small set of examples of the material changes that happen daily across US cities and sectors. Bitvore tracks different material situations continuously and helps map them to CUSIPs being sold and portfolios held. Together MSRB EMMA and the real-time continuous material situations from Bitvore for Munis, Chief Compliance Officers can speed their compliance for the SECs new MSRB Rule G-47. 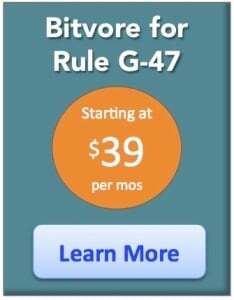 Learn more about Bitvore for Munis help for G-47 time of trade disclosure compliance.